Preheat oven to 325 degrees. Sprinkle salt and pepper over brisket and rub with garlic. Place chopped onions and leeks in bottom of casserole dish. In a heavy saucepan, sear brisket in canola oil until browned. 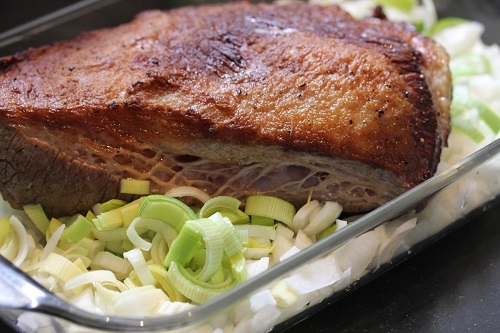 Place brisket, fat side up, on top of the onions and leeks in the casserole dish. 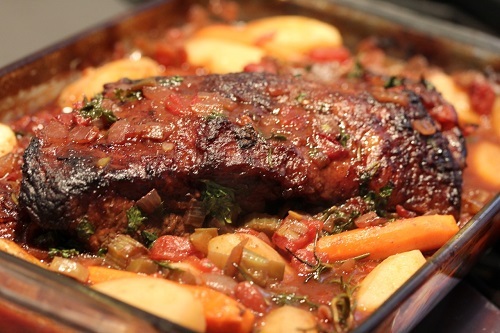 Cover with beef broth, tomatoes, red wine, celery, bay leaf, thyme and rosemary. Cover and bake for four hours, basting with pan juices. Add parsley, potatoes, and carrots, and bake uncovered for half an hour. 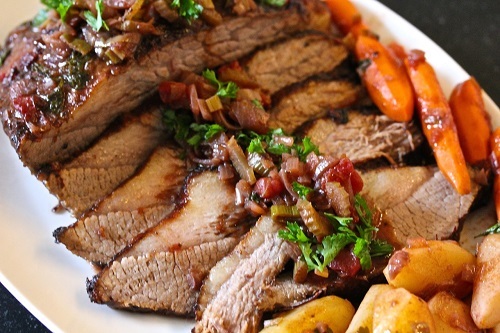 Brisket should be tender enough that you can easily stick a fork in it. To carve, place brisket fat side down and cut across the grain in the thinnest slices possible. Pour the hot juices and cooked onions and leeks over the meat, garnish with parsley, and serve.